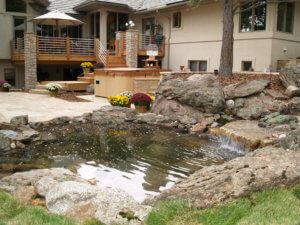 Water Features are one of our favorite things to build in a Colorado Landscapes. Outdoor living spaces with water features or fountains provide a wonder feeling and sound. We specialize in creating water features with a natural appearance, using boulders and plantings to create that rocky mountain feel. We can design water features in many different styles and sizes. No two water features are ever the same. We design natural appearing water features, formal water features, water fountains and pool features. Water features are limitless in their design possibilities and we make sure to design water features that fit with our customers’ needs and the property’s architecture. Trust Evergreen Landscape & Design to help design your dream water feature in Evergreen, Colorado or the surrounding communities of Conifer, Morrison, Genesee, Golden or the Denver Metro areas. Water features are surprisingly water efficient. The amount of water loss due to evaporation in a water feature is only a fraction of the amount of water used to irrigate an area of the same size. Pond-less water features are very efficient and require very little maintenance. A pond-less water feature is installed with the reservoir or what would be the pond, below the surface. Thus, the water in the reservoir is never exposed to the evaporation of the wind or sun. Additionally, they do not have as much tendency to get algae due to their lack of sun exposure. A pond-less water feature provides all the enjoyment of a water fall without some of the maintenance a traditional pond will require.